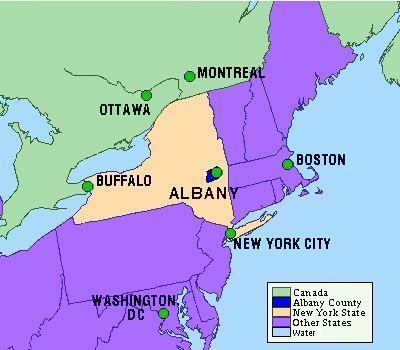 Message Board for those researching Albany County. You can post any questions or comments about research in this County. Please be courteous; remember you were once a beginner. If you have records you would like to share, such as wills, directories, etc, you can post them here. These records should be related to geneology or local history of Albany County, NY. This site is new and still under construction. If you have comments, suggestions, or if you would like to recommend some links, please contact me here. This entire site was last updated February 20, 2006. This nonprofit county historical and genealogical research site is an independent affiliate of the American Local History Network, Inc. (ALHN), a member of the USGenWeb Project, and hosted at no charge by, USGenNet a nonprofit public benefit corporation. No claim is made to the copyrights of individual submitters, and this site complies with with USGenNet's Nonprofit Conditions of Use .